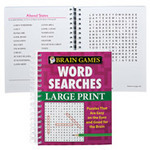 Large print word search book has large words—but better yet, the back cover is very stiff, so you can fold it open and easily work a puzzle on the bus, a sofa, even bed. Wirebound to lay flat, 7 3/8" x 9 1/8". 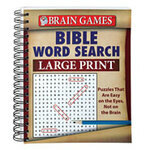 Large print bible word search will help boost your brain, enhance your Bible knowledge, and give your eyes a break! 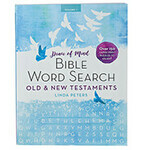 Challenging, large-print bible word search puzzles each span 2 full pages for easy reading. 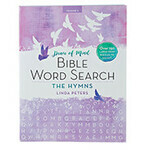 Spiralbound softcover, 192 pages. 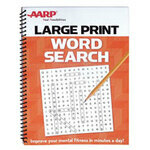 9" long x 7 1/4" wide.